24-January-2017: Curious Dr. MISFA was featured in an other article: "Curious Dr. MISFA injects a healthy dose of curiosity into robots" by Katyanna Quach, The Register, 2017. PC member of CLDL (NIPS) 2017. PC member of AAAI 2016 & 17. 25-February-2016: My work was featured in the article: "Curiosity Depends on What You Already Know" by Zach St. George, Nautilus magazine, 2016. 1-March-2015: Joined Prof. Laurenz Wiskott's group at the INI, Ruhr University Bochum. 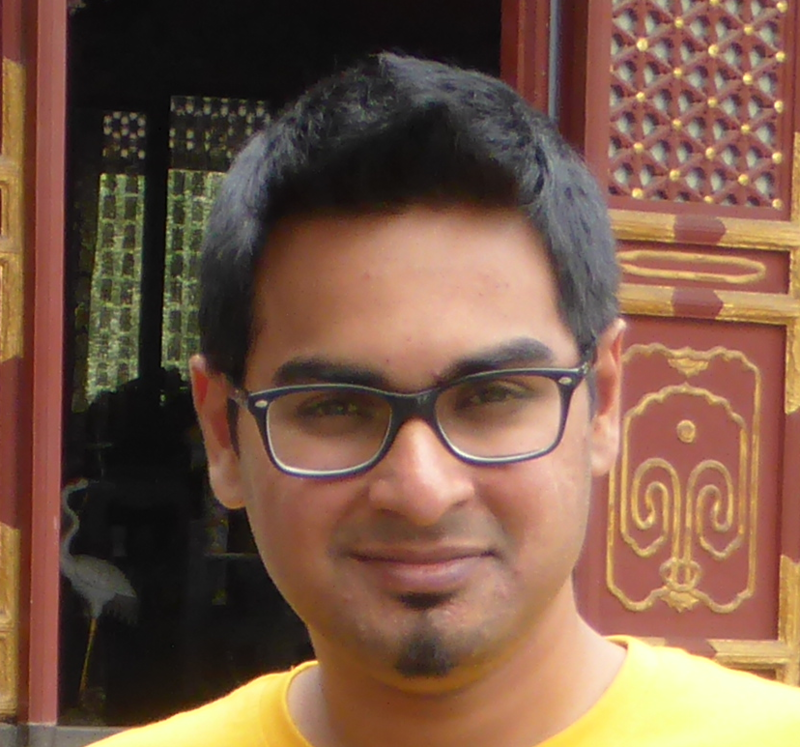 18-December-2014: Successfully defended my Ph.D. thesis titled "Slowness Learning for Curiosity-driven Agents"
I am a postdoc working at the Institute for Neural Computation (INI), Bochum. I received a PhD degree from Università della Svizzera Italiana (USI) for my work on Slowness Learning for Curiosity-Driven Agents. I had carried out my PhD research under the supervision of Prof. Juergen Schmidhuber at the Swiss AI Lab IDSIA. Prior to that, I had received my Masters of Science (MS) in informatics with specialization in graphics, vision and robotics from Institut Nationale Polytechnique de Grenoble (INPG). I carried out my Master's Thesis at the PERCEPTION group, INRIA - Rhone-Alpes under the supervision of Prof. Peter Sturm. I also worked as a research intern at the Honda Research Institute (HRI), Germany and at the Indian Institute of Science, Bangalore. Thank you for visiting my site. Currently, I study methods that potentially enable artificial-agents/robots self-motivated (curious) to continually explore and learn useful action sequences in high-dimensional environments. During my PhD studies, I worked on an approach that combines slowness learning and the theory of artificial curiosity within a single online reinforcement learning framework. A summary of this work and some other algorithms that I have developed so far can be found below. Ph.D. Thesis. V. R. Kompella "Slowness Learning for Curiosity-Driven Agents" . Advisor: Juergen Schmidhuber, IDSIA/SUPSI/USI. Defended on Decemeber 18 2014. Link to the manuscript. Jury: Prof. Benjamin Kuipers, Prof. Srini Narayanan, Prof. Laurenz Wiskott, Prof. Stefan Wolf, Prof. Matthias Hauswirth and Prof. Juergen Schmidhuber. M.S. Thesis. V. R. Kompella "Image-based Detection of Semi-Transparent Objects" . Advisor: Peter Sturm, INRIA Rhône-Alpes, Grenoble. Defended on June 25 2009. Link to the manuscript. T1. "Slow Feature Analysis for Curiosity Driven Agents", IEEE WCCI-2014, Beijing, China. Link to the tutorial page. P1. V. R. Kompella and D. Ghose. "Machine Vision Based Obstacle Avoidance System", Pub. No. : US 2011/0050883 Al, U.S. patents on the following inventions: (a) Vision-based guiding cane (b) Vision-based wheelchair. J5. V. R. Kompella, M. Luciw, M. Stollenga and J. Schmidhuber. "Optimal Curiosity Driven Modular Incremental Slow Feature Analysis", 28(8):1599-1662, Neural Computation Journal, 2016. Link to preprint. J4. V. R. Kompella, M. Stollenga, M. Luciw and J. Schmidhuber. "Continual curiosity-driven skill acquisition from high-dimensional video inputs for humanoid robots", Artificial Intelligence, 2015, Doi:10.1016/j.artint.2015.02.001. Link to preprint. J3. M. Luciw*, V. R. Kompella*, S. Kazerounian and J. Schmidhuber. "An intrinsic value system for developing multiple invariant representations with incremental slowness learning", Frontiers in Neurorobotics, Vol. 7 (9), 2013. *Joint first authors. Link to paper. J2. V. R. Kompella, M. Luciw and J. Schmidhuber. "Incremental Slow Feature Analysis: Adaptive Low-Complexity Slow Feature Updating from High-Dimensional Input Streams", Neural Computation Journal, Vol. 24 (11), pp. 2994--3024, 2012. Link to preprint. J1. V. R. Kompella and P. Sturm. "Collective-Reward Based Approach for Detection of Semi-Transparent Objects in Image", Computer Vision and Image Understanding, Vol. 116 (4), pp. 484--499, 2012. Link to preprint. C8. V. R. Kompella, M. Stollenga, M. Luciw and J. Schmidhuber. "Explore to See, Learn to Perceive, Get the Actions for Free: SKILLABILITY" , IEEE International Joint Conference on Neural Networks (IJCNN), pp. 2705-2712, Beijing, 2014. Link to paper. C7. V. R. Kompella, S. Kazerounian and J. Schmidhuber. "An Anti-Hebbian Learning Rule to Represent Drive Motivations for Reinforcement Learning" , International Conference on the Simulation of Adaptive Behavior (SAB), Castellon, 2014. Link to paper. C6. V. R. Kompella, M. Luciw, M. Stollenga, L. Pape and J. Schmidhuber. "Autonomous Learning of Abstractions using Curiosity-Driven Modular Incremental Slow Feature Analysis. (Curious Dr. MISFA)" , IEEE International Conference on Developmental and Learning and Epigenetic Robotics (ICDL-EpiRob), San Diego, 2012. Link to paper. Link to Video. C5. V. R. Kompella, L. Pape, J. Masci, M. Frank and J. Schmidhuber. "AutoIncSFA and Vision-based Developmental Learning for Humanoid Robots" , 11th IEEE-RAS International Conference on Humanoid Robots (Humanoids), Bled, Slovenia, 2011. Link to paper. Link to Video. C4. V. R. Kompella, M. Luciw and J. Schmidhuber. "Incremental Slow Feature Analysis", 22nd International Joint Conference on Artificial Intelligence (IJCAI), Barcelona, 2011. Link to paper. C3. V. R. Kompella and P. Sturm. "Detection and Avoidance of Semi-Transparent Obstacles using a Collective-Reward Based Approach", IEEE International Conference on Robotics and Automation (ICRA 2011), Shangai, 2011. Link to paper. C2. V. R. Kompella, B.V. Sharschchandra, K.N. Krishnanand, and D.Ghose. "A Tracked Mobile Robot with Vision-based Obstacle Avoidance", 13thNational Conference on Mechanisms and Machines (NaCoMM07), Bangalore, 2007. Link to paper. C1. V. R. Kompella, Kiran Patil, D.V. Kaushik Kariappa, and J. Amit Madhav. "A Beacon-Based Docking System for an Autonomous Mobile Robot", 13th National Conference on Mechanisms and Machines (NaCoMM07), December, 2007. Link to paper. W1. M. Luciw, V. R. Kompella and J. Schmidhuber. "Hierarchical Incremental Slow Feature Analysis" , Workshop on Deep Hierarchies in Vision (DHV, Vienna), 2012. Link to poster. T1. V. R. Kompella, and L. Wiskott. "Intrinsically Motivated Acquisition of Modular Slow Features for Humanoids in Continuous and Non-Stationary Environments" , ArXiv e-prints, eprint no. 1701.04663, 2017. Link to paper. P2. "Curious Dr. MISFA injects a healthy dose of curiosity into robots" , by Katyanna Quach, The Register, 2017. Link to the article. P1. "Curiosity Depends on What You Already Know" , by Zach St. George, Nautilus magazine, 2016. Link to the article. Mailing Address: Varun Raj Kompella, Institut fur Neuroinformatik, Ruhr-Universitat Bochum, Universitatstrasse 150, Building NB, Room NB 3/35, D-44801 Bochum, Germany. © Copyright 2016, Varun Kompella.